I’ll admit, I used to be a circler. An underliner. A writer in margins. Until the day I wasn’t. 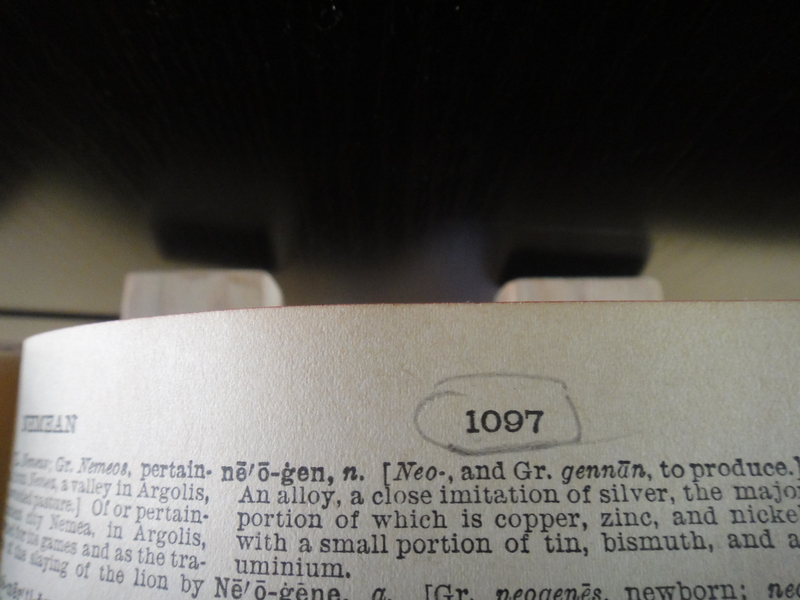 In this two-thousand-three-hundred-and-fifty-six-page dictionary, someone circled page 1097. No other comments. No rabbit ears. No bookmarks. Don’t get me wrong, I don’t mind pencil or pen or inserts or coffee stains in books. Scratchings show use. Things you leave behind mean you were there. They make for interesting blog posts. But really, you can only scratch where there’s an itch: no coaster for your coffee, for instance. Now I, occasionally, stumble across some arrogant aside written by College Christine, and my hope is that Old (Crotchety) Christine will find fewer but perhaps more meaningful quotations authored by Middle-Aged Christine. Or at least something mildly funny. Seems like you could write an entire story about what made this person circle that one number – was it mundane, or was it a combination of numbers that had a special meaning for them?